Email marketing is one of digital media’s most effective channels. 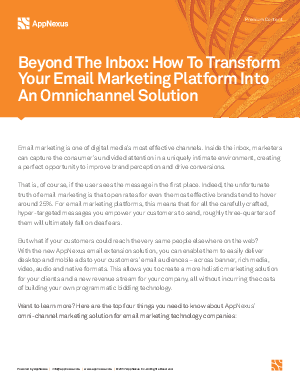 Inside the inbox, marketers can capture the consumer’s undivided attention in a uniquely intimate environment, creating a perfect opportunity for meaningful brand engagement and driving new purchase transactions. However, with open rates for even the most effective brands hovering around 25%, there is a huge opportunity for marketers to reach their known customers with impactful formats on the open internet, successfully engaging them across the marketing funnel.